Depth is a recently formed guild on the North American server Orwen. We are a small, self-motivated PvP guild, looking for interested individuals that have reached Lvl 57 and 400 GS, to join our small squad. While we are in a growing phase, we want joining members to understand that it is a long building process to find members that fit our criteria, for stats as well as personality. Our guild currently has a roster of 11 but are very active every day. Discord is our primary form of communication and we want new members to be more then comfortable joining our voice comms regularly! Our officer core was formed from a close group of like minded players originating from the guild Sarcasm. The need to create a group of players that were self-motivated and wanting to push themselves through progression, was highly sought. Based on each member's own desire to become stronger, we found that Sarcasm was not meeting our needs, and as a result we decided to break away from them to form the guild as described above. Since then, we have been slowly building a strong and dedicated core of members that are interested in BDO as much as we are. The guild is all inclusive. Each decision is made via a round table atmosphere, where everyone has an equal say about guild policy, and the direction the guild should take. In this environment we want everyone to feel like they are able to voice their own opinions about how the group plays. We aim to make Depth a welcoming environment that offers players a great opportunity to help mold this guild into something great. While we do have a Guild Master and Officers, the guild still runs on a democratic mindset; someone has to take care of the logistics no matter what. As players, we are all here for the same purpose, to play the game and have fun. If you're not having fun then it's no longer a game to be enjoyed. Great guild, easy people to chill with and pound for pound i'd say depth is just as strong if not stronger than most of the big guilds on our server right now, definitely worth looking into if you want a stronger pvp guild without the cloggyness and 'lost in the sea of people' feeling from the top pvp guilds on our server. 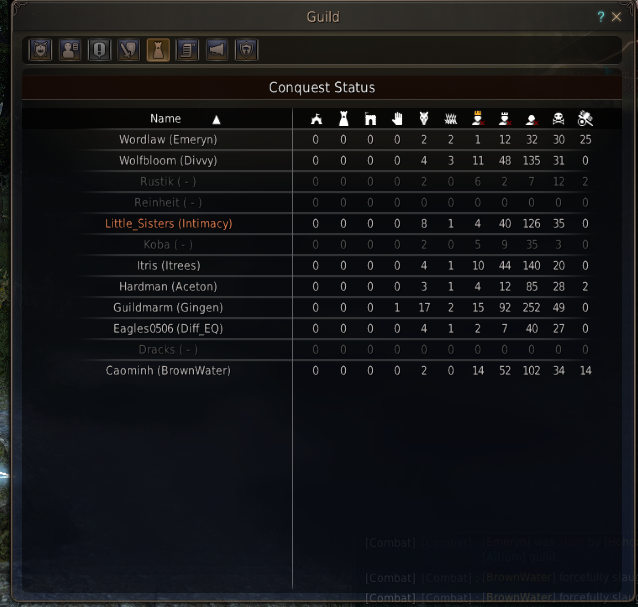 First node war this coming week as a new guild! Looking for more interested members! Looking for new members all the time. That sure was a fun node war. If only I didn't have to play defense so much. D: Hopefully we can take the next node we drop on! First node on the map! Unfortunately, the other guild did not show up. Really were looking for a fight but 45 mill from a T1 feels okay. Hopes are high!